It is nice of you to look after him. I hate seeing people in this state – it reminds me too much of my past. Hopefully he is just having a particularly bad time and this isn't a lifestyle choice. 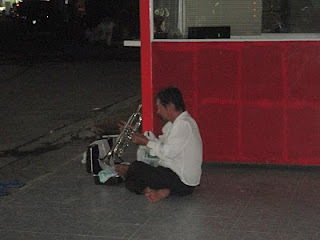 100 THB isn't bad for two notes – he would have been rich if he finished a whole song. 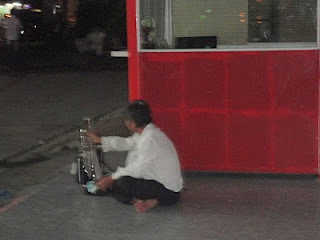 Yes true, it is not a nice sight, I hope he will be alright one day soon, all the Thai people preferred to ignore him so I thought better to help out a bit, and since I took these photo's I felt embarrassed not to give him anything, although I didn't expected him to be able to buy another whiskey. 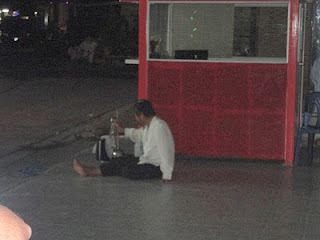 This was intended just for the photo's and get him playing, not for more booze, which he wasn't able to finish, because he was too drunk.